MakingtheGrade posted this stunning Serpent ring on the Show Me the Bling forum at PriceScope. It’s the spookiest time of the year, Halloween is next week and the ghouls and goblins are everywhere you look. Serpents are one of the more beautiful, while unnerving images evoked for the season. Serpents are the at the heart of many phobias and dark tales, so they bring about a bit of mystery. Serpentine jewelry has been popular for thousands of years, snakes have been considered symbols of both good and evil. 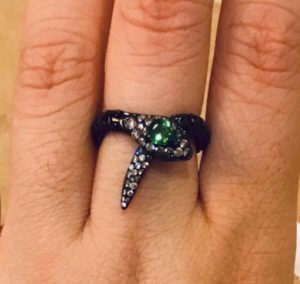 This particular snake is gorgeous and MakingtheGrade will be able to call her serpent a symbol of luck and beauty just due to adding it to her jewelry collection! MakingtheGrade is looking for help naming this fella and is reaching out to PS to assist! Go add your suggestions to the original post! Per MakingtheGrade: “He’s made of buttery articulated 14k gold covered in black rhodium, with a tsavorite head, yellow diamond eyes, and diamond scales on head and tail.” He was purchased from Ivy and Rose. 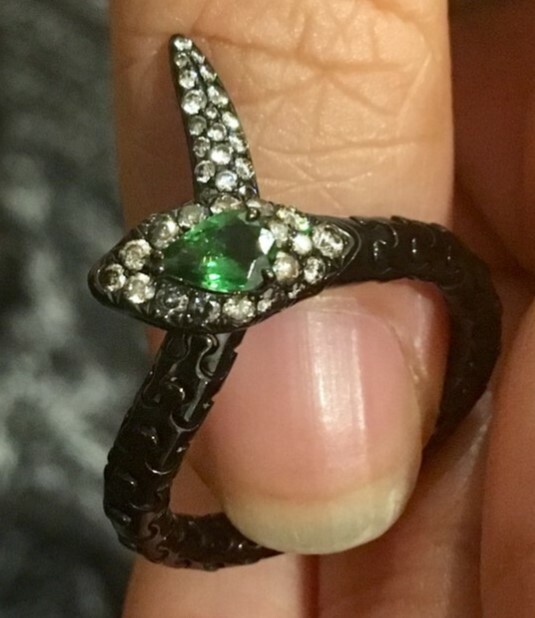 I love this serpent ring, congratulations to MakingtheGrade, and Happy Halloween to all! Go see the post with more pics! What do you look for when buying colored gems?